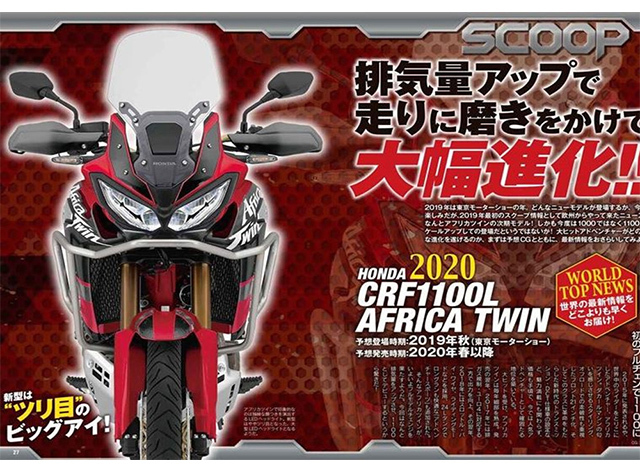 Re: New and more powerfull Africa Twin 1080 announced for 2020? I'd like to see a lighter 700cc version myself. Inside information: The Africa Twin receives this 'upgrade' to make room for a lighter version which could compete with the new Teneré T7. It will be a twin too, rumors are speaking about a Transalp successor. Isn't the new CB500X supposed to be "Africa Twin" styled?? Launched later this month. What ever they do, I will not be buying one. I am sticking with my AT, the only thing I need to swap out at some point are the front forks for premature internal wear. Cheaper to swap these out than trade in on a new bike and begin the customization all over again! lighter but damn I don't want to shove money in it every 2 years !!! But I still prefer my 2017 AT style overall, it's just seeing this T700 or the KTM 790 ADV and their low weight, makes me envious ! damn I don't want to shove money in it every 2 years !!! I love my AT but I'd be tempted to get one if it were smaller - 500/650/750/800 and lighter with similar characteristics to the current AT. An under 400 pound bike (180 kg) would be more versatile, still a good tourer, and much more manageable offroad. I have to say I'm still in love with my AT. they lost their English roots to me and of course BMuu still costing 2 testicles and not reliable. Though lighter it's said to only do 80Nm and 80Hp, but interesting one. So my trusty AT as still all the boxes ticking, I think I can live with it quite a while ! Weird I didn't notice that, I'm 1m83 and even with the AT saddle high I can flat foot fine, but I'm not sure I'd switch to the Guzzi, it's barely lighter and makes 15nm less, I'll try but I think I'll miss the Honda's pull. Also I love my AT don't want to crash it, but I don't know there's something about this bike even when you offroad, I'm never really aprehensive or scared to scratch it. When I saw the Guzzi, first thing I thought is nice Ducati like finish and design it's magnificent and so, God I think I'd cry if it would get scratched or fall So might not be the adventure bike in this sense, or that's just me.